Gender and the self have been frequent subjects of her work ever since, as in Sperm (2006), about her unsuccessful search for a sperm donor, and Wedding, a recent project in which she documented her fictional attempts to marry herself. 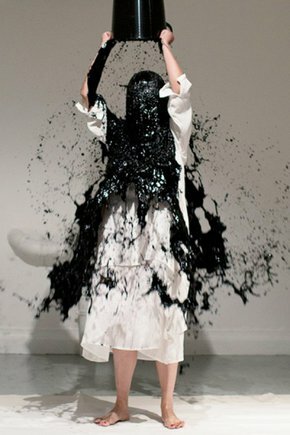 Still being an avant-garde artist that continues to work with performance art as well as with video, photo and installation, Xiao Lu is an important force on the Chinese art scene and have in performances as well as in her exhibitions shown an artistic strength being a symbol of integrity. Xiao Lu : The Confluence of Life and Art by Jonathan Goodman. Reinterpreting Xiao Lu by Li Xin Mo. The Sound of Gunshots, Half a Life’s Dialogue: On Xiao Lu’s “Dialogue” by Gao Ming Lu. Two Gunshots: The Curtain Call of the New Wave in Art! By Li Xian Ting. Xiao Lu. One. LIve Action. Gothenburg, Sweden. 2015.